Our hearts are heavy this morning as we continue to learn more about the tragedy that unfolded in Florida yesterday. May the families, friends and colleagues of the victims find peace during this difficult time. A vigil was held Thursday for the victims of a school shooting in Parkland, Florida. Police say an Uber car dropped off Nikolas Cruz at his former school around 2:19 p.m. on Wednesday. 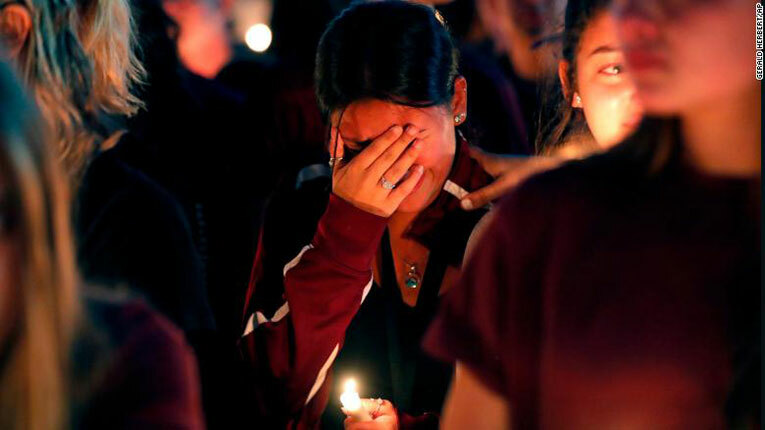 Within 10 minutes, authorities say he gunned down 17 people at Marjory Stoneman Douglas High School and left campus undetected in a crowd of students. Now, as the 19-year-old gunman begins his journey through the criminal justice system, a community is in mourning and investigators are looking for answers. The Sheriff’s Office identified the 17 victims Thursday afternoon. As he read the names, the Sheriff Scott Israel acknowledged his “special friend,” the school’s assistant football coach Aaron Feis, who threw himself in front of students as bullets flew. Cruz confessed to police to being the gunman, according to a probable cause affidavit. His public defender described him as a “deeply disturbed, emotionally broken” young man who is coming to grips with the pain he has caused. Meanwhile, Cruz’s digital footprint offers disturbing glimpses into his mind.